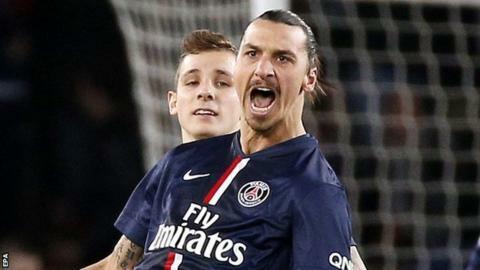 Paris St-Germain moved to the top of Ligue 1 after two Zlatan Ibrahimovic goals helped them come from behind to beat Nantes. The visitors took a surprise lead after eight minutes courtesy of Alejandro Bedoya's long-range strike. The home side hit back through Ibrahimovic with 10 minutes of the first half remaining. And the Swede was on target again just after the break to seal the win, which lifts PSG above Marseille in the table. However, Marcelo Bielsa's side can reclaim top spot with victory over Metz on Sunday. PSG remain the only unbeaten team in Ligue 1, and can now turn their focus to their Champions League encounter at Barcelona on Wednesday, which will decide who will finish top of Group F.
And Ibrahimovic will travel to face his former club full of confidence after his two goals - the first a close-range finish following a swift counter-attack and the second a well-placed free-kick. It takes his season's tally to 11 in all competitions, eight of which have come in Ligue 1. Match ends, Paris Saint Germain 2, Nantes 1. Second Half ends, Paris Saint Germain 2, Nantes 1. Ezequiel Lavezzi (Paris Saint Germain) wins a free kick in the defensive half. Foul by Issa Cissokho (Nantes). Attempt missed. Clément Chantôme (Paris Saint Germain) right footed shot from outside the box is high and wide to the right. Assisted by Adrien Rabiot. Foul by Georges-Kévin Nkoudou Mbida (Nantes). Substitution, Nantes. Vincent Bessat replaces Kian Hansen. Serge Gakpe (Nantes) wins a free kick on the left wing. Corner, Nantes. Conceded by Marquinhos. Georges-Kévin Nkoudou Mbida (Nantes) wins a free kick on the left wing. Foul by Lucas Deaux (Nantes). Attempt saved. Lucas Deaux (Nantes) right footed shot from the centre of the box is saved in the centre of the goal. Assisted by Serge Gakpe. Foul by Serge Gakpe (Nantes). Hand ball by Kian Hansen (Nantes). Substitution, Paris Saint Germain. Clément Chantôme replaces Javier Pastore. Substitution, Paris Saint Germain. Edinson Cavani replaces Lucas Moura. Attempt missed. Alejandro Bedoya (Nantes) header from the centre of the box misses to the right. Assisted by Yacine Bammou with a cross following a corner. Corner, Nantes. Conceded by Thiago Silva. Substitution, Nantes. Serge Gakpe replaces Rémi Gomis. Substitution, Nantes. Lucas Deaux replaces Jordan Veretout. Attempt missed. Ezequiel Lavezzi (Paris Saint Germain) right footed shot from the centre of the box misses to the left. Assisted by Serge Aurier with a cross. Rémy Riou (Nantes) wins a free kick in the defensive half. Corner, Paris Saint Germain. Conceded by Alejandro Bedoya. Attempt blocked. Lucas Digne (Paris Saint Germain) right footed shot from the centre of the box is blocked. Assisted by Serge Aurier with a cross. Attempt missed. Lucas Moura (Paris Saint Germain) right footed shot from outside the box is close, but misses to the left. Assisted by Zlatan Ibrahimovic with a headed pass. Olivier Veigneau (Nantes) wins a free kick in the defensive half. Papy Djilobodji (Nantes) is shown the yellow card for a bad foul.